The National U.S.-Arab Chamber of Commerce (NUSACC) this week supported the first "Day of Arab-Americans," a newly-created event organized by the Council of Arab Ambassadors in Washington DC and the League of Arab States to commemorate Arab immigrants to the United States. Hosted this year on December 4 at the National Geographic Society, the event featured a private showing of an exhibition entitled "1001 Inventions," which depicts one thousand years of science and technology invented or refined during Muslim and Arab civilizations. "Our event tonight pays tribute to our culture and heritage and to the unique legacy of our ancestors. For centuries, the Arab and Muslim worlds were credited with great civilization. [Arab-Americans] have been able to preserve traditions and values which are rooted in the rich civilization we have just seen in the '1001 Inventions' exhibition," stated H.E. Mohammed Al-Hussaini Al-Sharif, Ambassador of the League of Arab States in Washington DC. "[Arab-Americans] have successfully participated in all aspects of American life. Their achievements are reflected in assuming important positions from Cabinet posts to Congressmen to Ambassadors to four-star generals to mayors to aerospace scientists, you name it, and they have an important role to play as a bridge between the Arab world and the United States." Ambassador Al-Hussaini Al-Sharif concluded, "I would like to pay tribute and special thanks to the Council of Arab Ambassadors in Washington for their contribution and support. Also, my thanks go to the National U.S.-Arab Chamber of Commerce and the National Geographic Society for their support." H.E. Antoine Chedid, Ambassador of Lebanon to the United States, added "The aim of this event is to create a space free from religious and political influence, a space that welcomes and encourages the Arab-Americans and the Americans to meet, to socialize, and to share the Arab's unique culture and heritage." Terry Garcia, Executive Vice President of the National Geographic Society (NGS), noted, "We are delighted and honored that you have selected NGS as the location for your first annual 'Day of Arab-Americans' celebration. Our goal at NGS is to help people to understand the world, because to know the world is to change it. Exhibitions like '1001 Inventions' are one important way we speak to our audience and members." "I would be remiss if I did not mention one particular element of the Arab and Muslim communities that plays a pivotal role, not only in shaping foreign policy, but also helping us to carry it forward -- and that is the Diaspora organizations. Palestinian-, Syrian-, Lebanese-, Egyptian-, Iraqi-, Yemeni-, Tunisian-, Libyan-, Algerian-, and Moroccan-American groups -- among others -- are so vital to our understanding of the region, to the shaping of policy, to providing feedback, and to sharing ideas," added Hon. 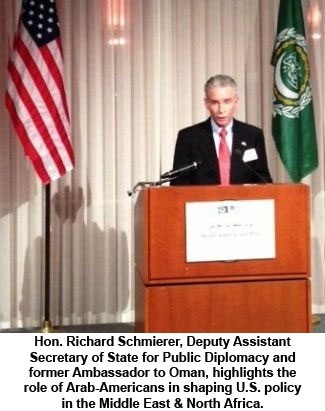 Richard Schmierer, Deputy Assistant Secretary of State for Public Diplomacy and former Ambassador to Oman. "Tonight's event is a well-deserved celebration, not only of past achievements, but of the current and future contributions of Arab- and Muslim-Americans to this country, and to the global community." This year's celebration lays the groundwork and sets the tradition for an annual event to gather distinguished Arab-Americans who have played a trailblazing role in enhancing cooperation and promoting dialogue among the diverse communities and cultures in the United States. David Hamod, President & CEO of the National U.S.-Arab Chamber of Commerce, commented, "Our Chamber is proud to support the work of the Arab League and this first-of-its-kind celebration of Arab-Americans. The Arab-American community is an integral part of America's social fabric, and Americans of Arab descent will continue to serve as leaders in the United States at the national, state, and local levels in a wide range of capacities."